Like many individuals, I chose to come home for a couple months after the hurricanes in the Caribbean devastated the Virgin Islands. I have been using this time to visit and catch up with old friends. This week I am visiting friends in South Carolina. To pay for my room and board, I have been testing out recipes. Tonight, I am cooking with my best friend from kindergarten. We have grown up like sisters, and this is the first time I am getting to visit her and her husband in their gorgeous house near Charleston, South Carolina. While I love cooking, I am not one to slave over the stove. I gravitate towards recipes that require few ingredients, are fast to prepare, and require minimal clean-up. 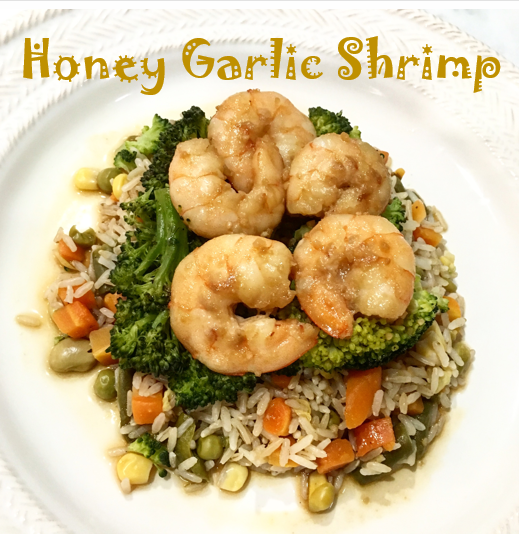 This honey, garlic shrimp recipes meets all of those criteria. Fresh or frozen shrimp may be used for this recipes. We used fresh local shrimp for tonight’s meal; it was fantastic! If you are using frozen shrimp, run it under cool water for a few minutes to thaw before cooking. Then marinate it. Next time I plan to make this in the morning before work and let it marinate all day in the fridge. You can make this shrimp dish with a variety of sides. I recommend choosing a whole grain and a green vegetable. Tonight I am making this dinner with brown rice and broccoli. 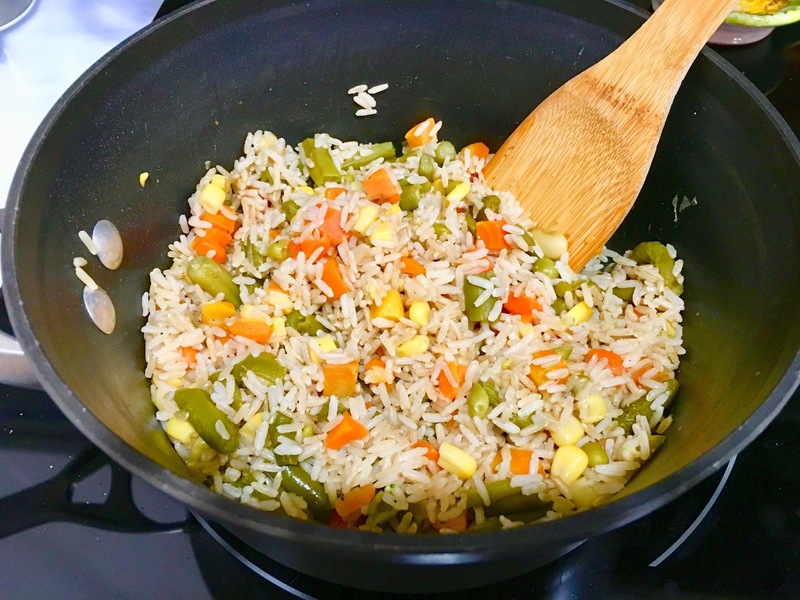 When it comes to rice, I like to mix it up by making it “fried style”, which basically means stirring in a can of mixed vegetables. I try to buy low-sodium or “no salt added” canned vegetables whenever possible. If you can’t find low-sodium canned vegetables, it’s ok. You can significantly reduce the sodium content simply by rinsing and draining the vegetables well. Frozen vegetables can be used as well and are often lower in sodium than their canned counterparts. Tonight we used a combination of peas, carrots, green beans, corn, and lima beans. Add garlic, onion powder, and pepper to taste. For the broccoli, prepare how you prefer. 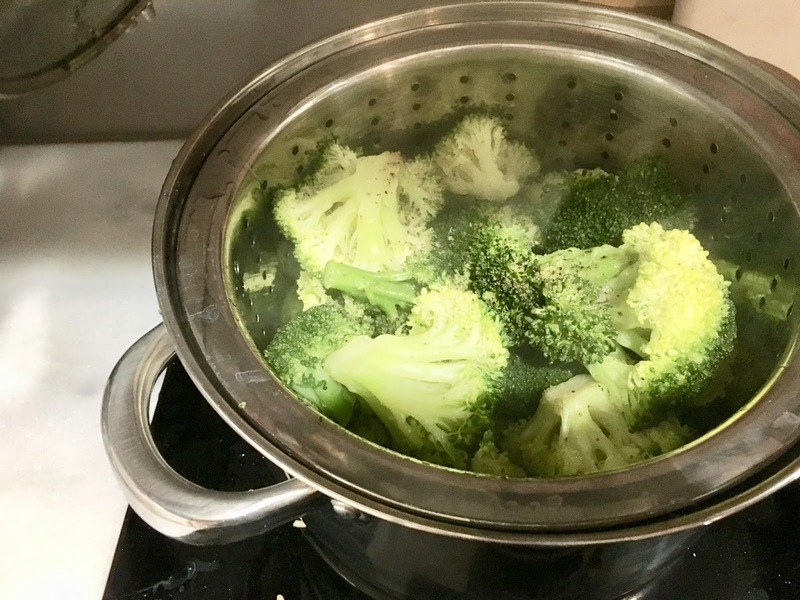 You can purchase fresh or frozen broccoli and steam in a pot. When power isn’t an issue, I like to keep a few frozen bags of broccoli you can just pop into the microwave and steam in the bag for a quick side. This dish could also be prepared with broccolini or asparagus, whatever you have on hand! This is the first time I have tried this recipe and it turned out pretty well! I’ve tried to make a variation of this dish several times before on island. However, finding soy sauce can be difficult. I drove to three different stores and have yet to locate any low-sodium soy sauce on island. I recently mailed myself a low-sodium brand to cook with when I get back. Going forward I will be ordering my soy sauce online. For next time, what would I do differently? Add more seasoning to the rice and broccoli such as onion powder and red pepper. Additionally, I was disappointed once I calculated the nutrient content and discovered the sodium was pretty high. This is from the shrimp, which are naturally high in sodium, and soy sauce, which is still HIGH in sodium even though it is the LITE version! For individuals with hypertension I would recommend trying this recipe with chicken instead of shrimp to reduce the sodium content to about 600mg per serving. Personally, I am not as concerned with the sodium content, because I am active and generally avoid other high sodium foods. While I won’t be eating this every night, I will be adding it to the weekly meal rotation! It’s just so good and easy!! 1 can low-sodium mixed vegetables, drained and rinsed. 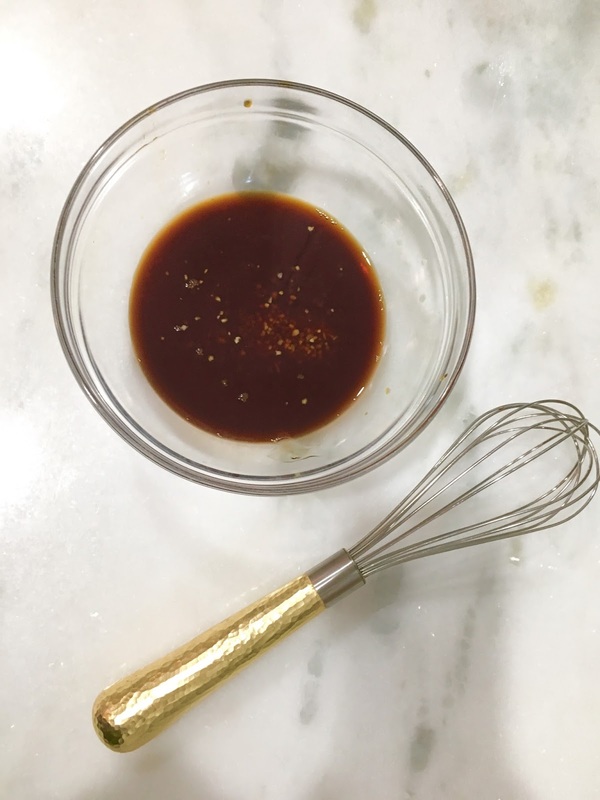 Whisk together garlic, honey, soy sauce, and ginger (optional) in a bowl. Place shrimp in bowl to marinade for at least 15 minutes. While shrimp are marinating, steam broccoli. Then mix brown rice with can of mixed vegetables and set aside. Heat olive oil in sauce pan over medium heat. 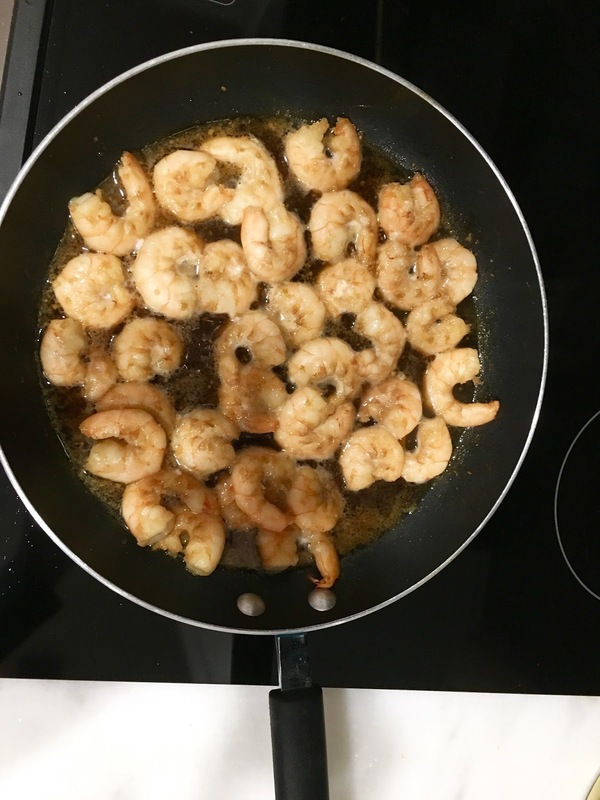 Place shrimp in pan and cook for about 45 seconds. Then flip shrimp and add marinade, cook for another 1-2 minutes. Dish onto plate with rice and broccoli….VIOLA!